For most Bible readers, the book of Revelation is a riddle that fascinates and frustrates. Scholars and teachers have proposed different keys to its interpretation. However, neither the `futurist' nor the historical-critical approach adequately demonstrates the ongoing, vital relevance of the Apocalypse for the contemporary church.Brian Tabb stresses the importance of the canonical context of the book of Revelation. He argues that it presents itself as the climax of biblical prophecy that shows how various Old Testament prophecies and patterns find their consummation in the present and future reign of Jesus Christ, who decisively defeats his foes, saves his people and restores all things. Tabb considers key themes in the book: the triune God; Christ's followers and foes; God's plan for salvation, judgment and restoration; and God's word. He also shows how the book's symbolic visions shape believers' worldviews around what is true, good and beautiful according to God's revealed standards, and motivate them to live obediently and counter-culturally in the world as faithful witnesses to Jesus. 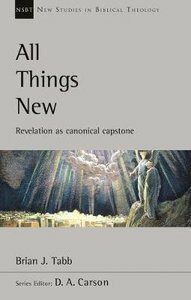 About "All Things New: Revelation as Canonical Capstone (New Studies In Biblical Theology Series)"